With its angular lines and black finish, the styling of this microphone (which is nicely compact, being just 138 x 52 x 36 mm in size) is unmistakably Lewitt. The LCT 440 Pure ships with its own LCT 40 SH shockmount, an LCT 40 Wx windscreen, a DTP 40 Lb soft storage bag and an LCT 50 PSx pop shield. All this comes in a cardboard box, so you won’t have to find space for yet another camera case. 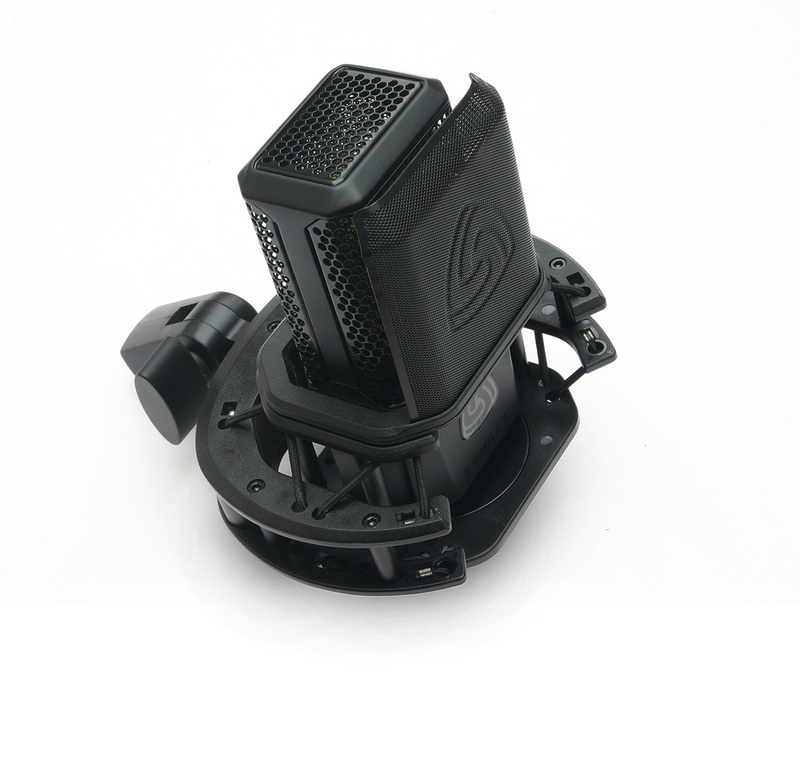 The shockmount is worthy of mention as it holds the mic very securely via a twist-lock yoke, which fits around the stem of the mic, and the design of which means the elastic elements won’t fall off. 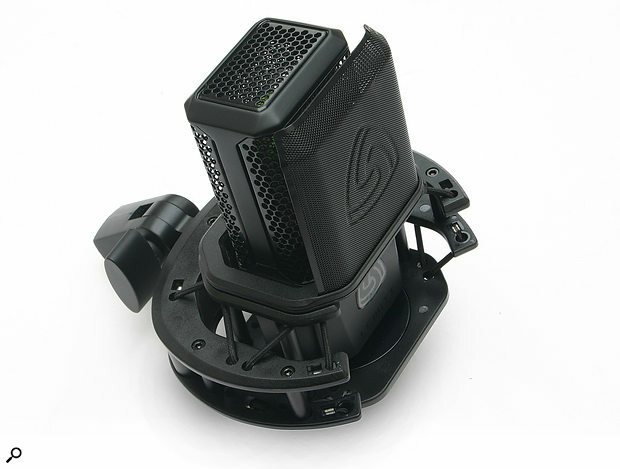 The shallow shape cradles the mic without obstructing it, while the pop shield clips onto the mount via integral magnets. Though it sits fairly close to the mic grille, it seems to avoid all but the most determined popping. Phantom power is required for operation and is specified as being in the ±4V range around the standard 48V, and there are no pad or filter switches. A look at the frequency response graph shows that the mic exhibits the familiar large-diaphragm presence lift, in this instance reaching a peak in the region of 12kHz with a lesser peak at 4kHz, though the rise up into the presence region is quite gentle, which suggests the mic should sound more airy than aggressive. The low end only rolls off by around 2 to 3 dB at 20Hz, so for some applications a low-cut filter on the desk or preamp might be advised. At the high end the response doesn’t start to drop away until above 20kHz. Testing the mic on speech revealed firstly that the LCT 440 is a little more sensitive than the Aston mic I used for comparison, and secondly, that I was right about that gentle lift giving the mic an airy sound. Speech sounds clear and very ‘present’ but without being harsh, while the low end remains solid, making this a good choice of vocal mic for those singers who need a little help with their clarity. The ‘airy’ character is not overstated, but if you do yearn for a warmer sound, you can always turn the mic slightly off axis to lose a little high end. The equivalent input noise is given as 7dBA, which is very low, and my experience confirmed that noise is not an issue. If asked to describe the character of the mic I’d say it was natural sounding but on the airy side of neutral, which is no bad thing in pop-music work. Acoustic guitar also comes over as well balanced and with good articulation, suggesting that it would make a good choice for a range of acoustic instruments wherever there’s a need to retain good definition. Given that the mic and all the included accessories come at such an attractive price (which may be even lower if you shop around), I can see Lewitt doing very well with this microphone, as despite its lower cost it upholds the quality of the Lewitt name in both build and performance. This market sector is rife with similarly priced cardioid-pattern mics from the likes of AKG, Audio-Technica, sE, Aston, MXL, Sontronics and so on, but as always it is more about picking a model to suit your voice than relying on the spec sheet. Sounds good on instruments as well as voice. No storage box other than cardboard. A mic priced for the home studio, but one that also performs well enough to rub shoulders with Lewitt’s more upmarket studio models — and it comes with a range of elegant accessories!